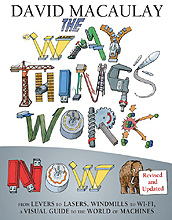 Explainer-in-Chief David Macaulay updates the worldwide bestseller The New Way Things Work to capture the latest developments in the technology that most impacts our lives. Famously packed with information on the inner workings of everything from windmills to Wi-Fi, this extraordinary and humorous book both guides readers through the fundamental principles of machines, and shows how the developments of the past are building the world of tomorrow. This sweepingly revised edition embraces all of the latest developments, from touchscreens to 3D printer. 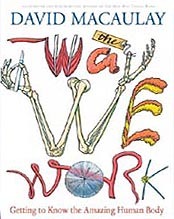 Each scientific principle is brilliantly explained--with the help of a charming, if rather slow-witted, woolly mammoth. Hardcover Illustrated Book. Ages 9 & up. This new book - inspired by four classic, award-winning books - reveals the how and why behind some of the most fascinating and enduring structures humankind has ever created. 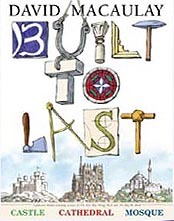 Macaulay has revised texts based on new research, created gorgeous new drawings in black and sepia inks, in some cases wholly re-imagined scenes from the books - bringing City, Castle, and Cathedral to life in full-color for the very first time. The resulting illustrations add to the reader's understanding of these various buildings, capturing intriguing new perspectives and a depth of detail in structure and atmosphere. Hardcover Illustrated Book. Ages 9 & up. 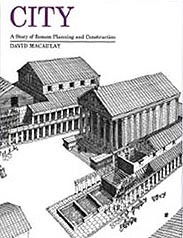 A Story of Roman Planning and Construction: In his creation of an imaginary ancient Roman city, the author demonstrates that the Romans were successful in the realms of urban planning and construction of their cities for the people who lived within them. Hardcover Illustrated Book.